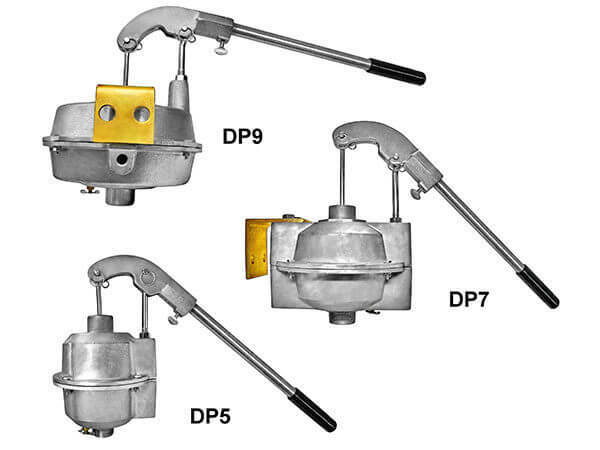 THE DP DIAPHRAGM HAND PRIMER is an air pump that creates vacuum in a centrifugal pump priming line and pulls water up into the pump to prime it. The Diaphragm Primer has a flapper check valve in the diaphragm and a disk check valve at the bottom of the unit. Air flows through the bottom check valve on the diaphragm up stroke then through the diaphragm valve on the down stroke. Diaphragm is actuated through a connecting rod eyebolt attached to a fulcrum handle bracket.